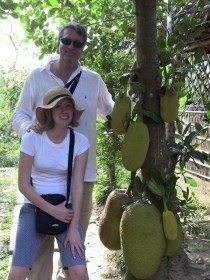 This Q&A originally appeared in Signature Travel Network’s Travel Magazine. Click on the image to download a PDF version. Traveling some 300 days a year, mostly at sea, Ralph Grizzle has sailed on over 100 ships everywhere from the rivers of Europe to the Panama Canal. 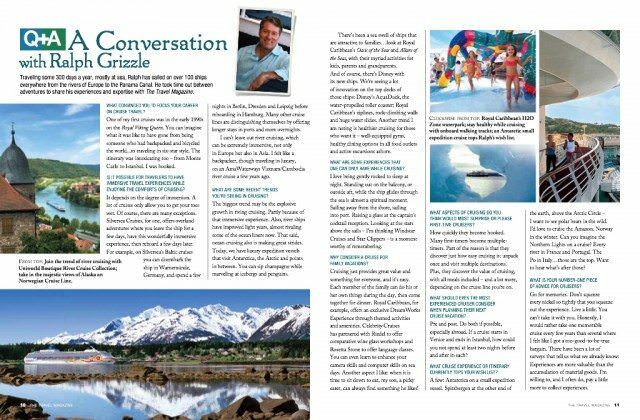 He took time out between adventures to share his experiences and expertise with The Travel Magazine. What convinced you to focus your career on cruise travel? One of my first cruises was in the early 1990s on the Royal Viking Queen. You can imagine what it was like to have gone from being someone who had backpacked and bicycled the world to traveling in six-star style. The itinerary on that cruise was intoxicating – from Monte Carlo to Istanbul — and immediately, I was hooked. 1. Is it possible for travelers to have immersive travel experiences while enjoying the comforts of cruising? It depends on the degree of immersion. A lot of cruises only allow you to get your toes wet. Of course, there are exceptions. Silversea Cruises, for one, offers overland adventures where you leave the ship for a few days, have this wonderfully immersive experience, then reboard a few days later. For example, on Silversea’s Baltic cruises you can disembark the ship in Warnemünde, Germany, and spend a few nights in Berlin, Dresden and Leipzig before reboarding in Hamburg. Other cruise lines are distinguishing themselves by offering longer stays in ports and more overnights. Azamara Club Cruises comes to mind. I can’t leave out river cruising, which can be extremely immersive, not only in Europe but also in Asia. I felt like a backpacker, though traveling in luxury, on an AmaWaterways Vietnam/Cambodia river cruise a few years ago with my 15-year-old daughter. To read more about that trip, check out cruisingthemekong.com. 2. What are some recent trends you’re seeing in cruising? The biggest trend may be the explosive growth in riving cruising, partly because of the immersive experience we just discussed. Also, river ships have improved light years, almost rivaling some of the ocean liners now. (Be sure to visit Ralph Grizzle’s River Cruise Advisor website). That said, ocean cruising also is making great strides. Today, we have luxury expedition vessels that visit Antarctica, the Arctic and points in between. You can sip champagne while marveling at icebergs and penguins. There’s been a sea swell of ships that are attractive to families. Look at Royal Caribbean’s Oasis of the Seas and Allure of the Seas, with their myriad activities for kids, parents and grandparents. And of course, there’s Disney Cruise Line with its new ships. We’re seeing a lot of innovation on the top decks of those ships: Disney’s Aquaduck, the water-propelled roller coaster; Royal Caribbean’s ziplines, rock-climbing walls and huge water slides. Another trend I am noting is healthier cruising for those who want it – well-equipped gyms, healthy dining options in all food outlets and active excursions ashore. People ask me how I maintain my weight while cruising so much. Well, for a long time, I didn’t. 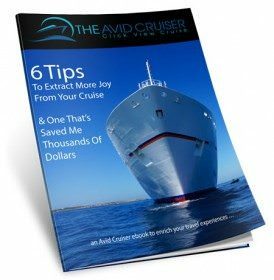 Read how I lost 35 pounds cruising and how I use cruising to maintain a healthy lifestyle. 3. What are some experiences that one can only have while cruising? I love being gently rocked to sleep at night. Standing out on the balcony, or outside aft, while the ship glides through the sea is almost a spiritual moment. Sailing away from the shore, sailing into port. Raising a glass at the captain’s cocktail reception. Looking at the stars above the sails – i’m thinking Windstar Cruises and Star Clippers – is a moment worthy of remembering. 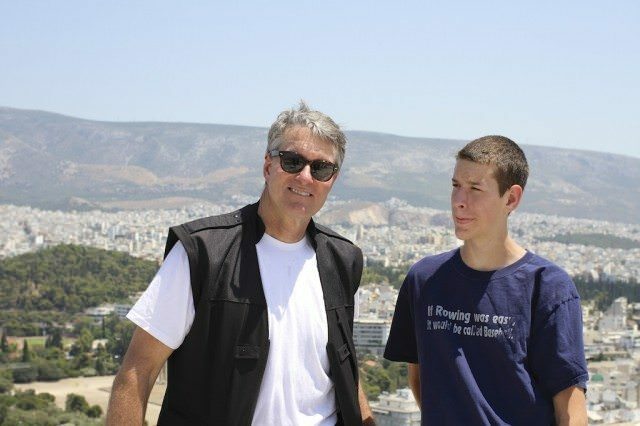 With my son in Athens, Greece, on Crystal Serenity. On cruises, he can always find food he likes! 4. Why consider a cruise for family vacations? Cruising just provides great value and something for everyone, and it’s easy. Each member of the family can do his or her own things during the day, then come together for dinner. For kids, Royal Caribbean International, for example, offers an exclusive DreamWorks experience through themed activities and amenities. For adults, Celebrity Cruises has partnered with Riedel to offer comparative wine glass workshops and Rosetta Stone to offer language classes. You can even learn to enhance your camera skills and computer skills on sea days. Another aspect I like: When it is time to sit down to eat, my son, a picky eater, can always find something he likes! 5. What aspects of cruising do you think would most surprise or please first-time cruIsers? How quickly they become hooked. Many first-timers become multiple- timers. part of the reason is that they discover just how easy cruising is: Unpack once and visit multiple destinations. Plus, they discover the value of cruising, with all meals included – and a lot more, depending on the cruise line you’re on. 6. 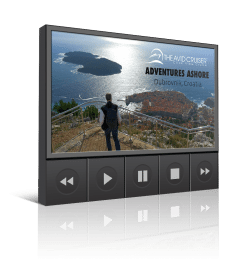 What should even the most experienced cruiser consider when planning their next cruise vacation? Pre and post. That’s industry jargon meaning that you should plan to stay in the ports of embarkation/disembarkation a few days before and/or after your cruise. Do both if possible, especially abroad. If a cruise starts in Venice and ends in Istanbul, how could you not spend at least two nights before and after in each? 7. What cruise experience or itinerary currently tops your wish list? Antarctica on a small vessel. Spitzbergen at the other end of the earth, above the Arctic Circle – I want to see polar bears in the wild. I’d love to cruise the Amazon. Norway in the winter. Can you imagine the Northern Lights on a cruise? Every river in France and Portugal, the Po in Italy. Those are the top. Want to hear what’s after those? There’s a lot. 8. What is your number-one piece of advice for cruisers? Go for memories. Don’t squeeze What is your number-one piece of advice for cruisers? nickel so tightly that you squeeze out the experience. Live a little. You can’t take it with you. I would rather take one memorable cruise every few years than several a year where I felt like I got a too-good-to-be-true bargain. There have been a lot of surveys that tell us what we already know: Experiences are more valuable than the accumulation of material goods. That’s certainly been true of my life. 9. Which cruise line is the best? Depends on which one I am on at the moment.